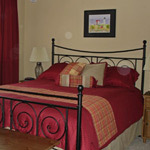 We also offer an alternative to pricey, bland hotels in Anchorage. 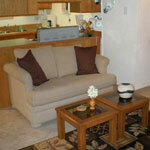 Our renovated condo is the perfect option for travelers heading to and from Seward, or for Alaskans shopping in the "big city!" 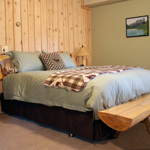 Awaken to the call of a bald eagle perched atop a spruce across the lake. Watch as the morning gives way to day and the sun illuminates the peaks surrounding the lodge. Listen as the tranquil waters of Bear Lake lap against the shore. Paddle a kayak to a salmon-spawning stream and marvel as the bright red sockeye jostle for position. Ride a mountain bike on a local trail and keep an eye out for moose or bear that may cross your path. Enjoy evening on the deck as the late summer sun slowly sinks behind the mountains. Retire to your room and fall asleep as the loons call to each other across the surface of the lake. In perfect complement to this magnificent setting, the lodge offers all of the comforts of home, including luxury linens and bedding, memory foam mattress toppers in each room, and a hearty breakfast each morning. Common areas include a family room with a large flat-screen TV, and a dining area with seating for 10 or more. Cable TV is available in suites, flat screens for DVD use are available in rooms, and the lodge features high-speed wireless internet as well. 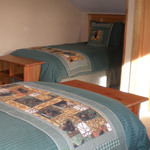 Though room prices are based on double occupancy, Bear Lake Lodgings welcomes families, and some of our rooms offer additional sleeping areas to accommodate extra people. For more information on pricing, click here. Choose from four different suites or rooms, each with its own unique character. 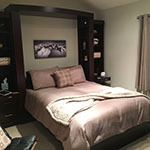 Click each photo on the right to view the different rooms.